AI in education market is driven by the integration of the Intelligent Tutoring System (ITS) in the learning process. ITS is one of the advanced applications of AI aimed at providing immediate and personalized feedback and instructions to learners without the intervention of a human tutor. The numerous benefits offered by the system is major factor augmenting its demand. It assists students in improving their learning styles, offering personalized tutoring and high-quality education by gauging their pre-existing knowledge and learning. The platform collects data points and employs machine learning and predictive models to determine individual knowledge and skill levels and analyze the performance. It also provides students immediate feedback for improvement. However, the high cost of deployment and lack of skilled workforce are the factors hindering the AI in education market growth. These systems are expensive to develop and implement and the timeframe required for the development of these systems is large limiting their implementation in the real world. Moreover, the risk of data leakage and security also restrain the market growth. AI assists in improving the quality of education by addressing the learning challenges faced in the past including planning, reasoning, language processing, and cognitive modeling. Various benefits offered by the acceptance of AI in education sector include tutoring grading, immediate feedback on course quality, personalization in education, and instant feedback to students. The aim of AI is to be a virtual facilitator for the learning domain and to create virtual human-like qualities, who can think, react, act, and interact in a natural way using verbal and non-verbal communication. The domain model in AI in education market is estimated to grow at a substantial rate with over 50% CAGR during the forecast period. The domain model represents the knowledge of the subject, expertise, and the relationship between different parts of the subject matter. It assists in improving the domain-specific knowledge, especially in areas of science, technology, math, and engineering. The AI in education systems usually gathers a huge amount of student data, which is computed to enhance the domain model. This helps in offering more personalized and efficient support while refining and testing their understanding of the process of learning and teaching. The deep learning model for AI in education market is anticipated to grow at a CAGR of 52% during the forecast timespan. The technology helps in protecting the teaching profession with tasks such as developing soft skills amongst students, cultivating pupils, and assisting them to train students and motivate them for better education. They offer collaborative learning methodology between teachers, students, and a wider environment with strong social and team-related skills. The advent of technology has hindered deep learning in schools. Asia Pacific is estimated to be the most lucrative region for AI in education market. The market is estimated to grow at a CAGR of over 51%. The digitalization and supportive government initiatives in the region have a noteworthy impact on the growth of the market. For instance, in 2015, the Japanese government launched Japan Revitalization Strategy, which focuses on the development of advanced robots equipped with AI and machine learning technology. Similarly, the Indian government is also promoting the use of technology education in schools and universities, shaping students into foremost innovators of the AI revolution. The finance ministry of India invested USD 474 million in their Digital India initiative to improve the digital literacy rate in various technologies, such as AI, and providing the internet to rural India. 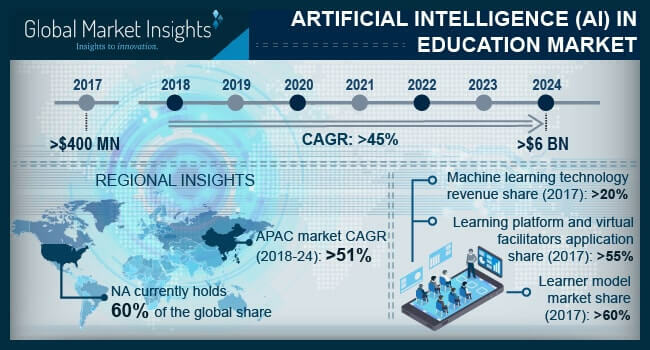 The key players in the AI in education market are IBM, AWS, Microsoft, Google, Nuance, Century Tech, Blackboard, Pearson, Cognii, Volley.com, Blippar, Knewton, Jenzabar, Content Technologies, PLEIQ, Luilishuo, Pixatel System, and Quantum Adaptive Learning.